come to our drop in Office Time in church 6.30-8.00pm on the first Tuesday of every month to discuss your wedding arrangements, no appointment is necessary, just turn up. If you have any special requests for music please contact Steve Hicking the organist directly. We provide live music with or without choir and we have the facility to play pre-recorded CDs. The organist can give advice on all music related enquires. Click below for more information on planning your wedding, FAQs and fees. Here are just a few hymns, there are many more (click to listen). Our advice is to go for what everybody knows. We also have the facility to play the CD of your choice. 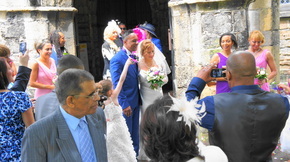 Wedding day at Gedling, guests join Robbie and Kate to celebrate their marriage on the 22nd June. Guests travelled as far away as Florida USA to be with them. We too at All Hallows offer our prayers and best wishes. 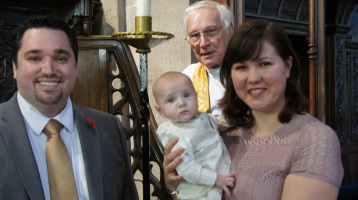 Baptisms at All Hallows church are usually held on Sundays at 11.15am. To discuss baptism and book a date, we have a drop in Office Time in church 6.30pm-8pm every 1st Tuesday of each month, no appointment is necessary just turn up. ​on it to remind them of the promises they made at the baptism. Please contact the Parish Secretary for further details. Contact details are on the home page.